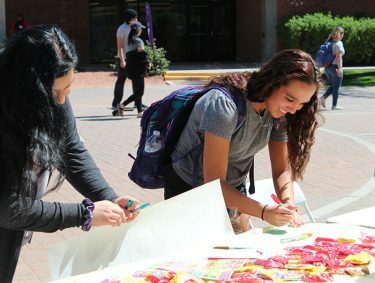 Jordan Cooley (left) and Kathy Britton help encourage students to write thank you notes to people who are important to them on the first day’s activity for Mental Health Awareness week. In times that could be considered high stress, sometimes we need to be reminded that we’re not alone, and that’s just what the third annual Mental Health Awareness Week is doing. 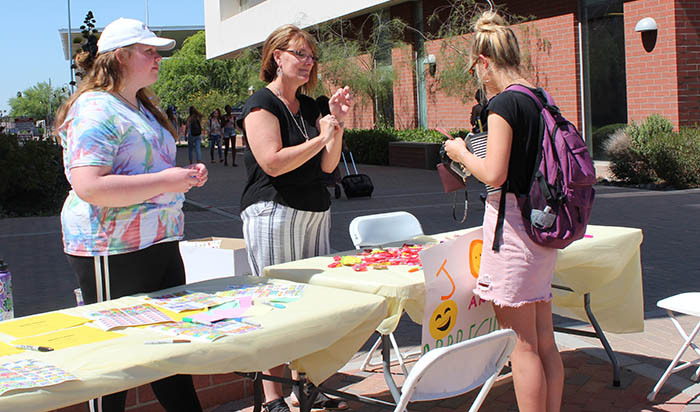 Students from the College of Humanities and Social Sciences have set up a table from 11 a.m. to 1 p.m. through Thursday on the Promenade and have activities planned to help spread positivity and self-appreciation among the student body in preparation for finals. Writing a note of appreciation is just one of the activities students can participate in during Mental Health Awareness Week. For some students, it’s a much needed break from all the stress in their day-to-day lives. One important difference in the initiative: It’s being led by students this time, and they have given it an activity-based awareness rather than a lecture-based structure. “It’s a little different this year,” said Kathy Britton, manager of the counseling program. “In the first two years we did a series of workshops, Monday through Thursday, that we would invite students to, everything from stress to suicidality, and we got moderate attention for it, so this was the first year that we used a student group to plan it. Students can create their own stress balls, a prayer for their own well being and participate in other activities encouraging both a sense of self-appreciation and an appreciation for others. There also are activities promoting calmness and relaxation. “It’s sort of a therapeutic practice,” Britton said. From 6 to 8 p.m. Thursday on the Quad, students are invited to what Britton and her students call “Blast from the Past.” They can participate in childhood activities such as Giant Jenga and a freeze dance game and make macaroni necklaces and fuse beads.